The cries of concern from some are startling, but BC is only catching up to the rest of the country by eliminating the Medical Services Plan and replacing it with the new Employer Health Tax. In last month’s budget, the provincial government confirmed it will scrap Medical Services Plan (MSP) premiums in 2020 and partly replace the forgone revenue with a payroll tax levied directly on businesses and other employers. This kind of payroll tax is standard fare in other provinces including Ontario, Québec and Manitoba. MSP is BC’s least fair tax and ours is the last province still charging individuals a flat health care levy. Starting in 2019, the Employer Health Tax (EHT) will raise a projected $1.9 billion annually, replacing part of the $2.6 billion previously raised from MSP premiums. Employers with payrolls larger than $1.5 million will see a payroll tax of 1.95 per cent, employers with payrolls between $500,000 and $1.5 million will pay a reduced rate and those under $500,000 will be exempt. 1) Eliminating MSP premiums means a fairer tax system. MSP premiums are a highly unfair, regressive tax. That’s because whether you make $45,000 or $450,000, you pay the same flat dollar amount (though those with very low incomes get assistance). Until the 50-per-cent cut to premiums in January, the charge for one adult had risen to $900 per year. Rising MSP premiums are a part of the reason overall tax fairness was eroded so badly in BC between 2000 and 2016—along with income tax cuts that overwhelmingly favoured the wealthiest few. Replacing MSP with the EHT is a significant improvement to tax fairness after years of corporate tax cuts and other business tax breaks. 2) EHT creates a level playing field among similar-sized businesses. Currently, employers who cover MSP premiums for their employees bear a disproportionate share of the tax compared to their competitors who do not pay for MSP. Instead of leaving it to these “good” businesses to contribute, the EHT creates a level playing field by requiring all businesses of a given payroll size to chip in. 3) Most small businesses are exempt from the EHT. Businesses with payrolls under $500,000 are entirely exempt from the EHT and those with payrolls between $500,000 and $1.5 million will pay a reduced rate. According to the government, 85 per cent of BC businesses will be exempt and only five per cent will pay the full EHT. I haven’t independently verified these figures, however, they are broadly consistent with publicly available data about small business sizes in BC. 4) There is no “double dipping” problem with the EHT as opponents claim. For businesses that currently cover MSP premiums for employees, in 2019 they will pay both the remaining 50 per cent of MSP and the new EHT, which some have claimed means the tax is “double dipping” during the two-year transition period. That claim is not accurate because it doesn’t account for the savings these businesses will receive from the 50-per-cent reduction in MSP premiums in 2018 and 2019 confirmed in the 2018 budget. Businesses also enjoyed large federal corporate tax cuts over the same period with the general rate dropping from 28 per cent to 15 per cent and the small business rate dropping from 13.12 per cent to 10 per cent. In short, the BC business sector should count its tax policy blessings. 7) Businesses will benefit from elimination of the MSP and increased consumer purchasing power. Any additional tax that business pays because of the EHT is a savings for individuals and families. With more purchasing power, households will spend that money in the local economy. Other measures in BC’s 2018 budget, including long-overdue public investments in child care and housing, will also take pressure off household budgets, again increasing purchasing power and the customer base for businesses. These economic benefits are too often ignored. 8) The government should consider giving EHT exemptions or compensatory funding to schools, municipalities and service agencies. Many of these types of employers currently cover MSP premiums and will receive considerable savings from elimination of the MSP. But some will end up paying more overall in EHT than MSP, depending on the levels of pay their staff members receive. Unlike businesses, these employers don’t have profits to draw on to pay increases resulting from the EHT. They also haven’t benefited from the slew of business tax cuts in recent years nor will they benefit from consumers’ increased purchasing power when the MSP is reduced and eliminated. 9) The remaining revenue from eliminating the MSP should be replaced. The CCPA has long called for eliminating the MSP, but we’ve also argued forcefully that the revenue should be fully replaced with fairer taxes. With the EHT, the government is so far only replacing $1.9 billion of the $2.6 billion in foregone MSP revenues. At a time when renewed public investment is badly needed for housing, child care, poverty reduction and responding to climate change, reducing our province’s fiscal capacity should not be an option. The good news is that the CCPA has modelled options to fully replace MSP revenue with fair taxes and the government’s MSP task force will report back at the end of the month with its own progressive tax options. The government can close this $700 million revenue gap by drawing on these recommendations. Notwithstanding the bluster and complaints from business lobby groups, eliminating MSP premiums and implementing the Employer Health Tax is a genuine step forward for tax fairness in BC. See Table A2, interprovincial Comparisons of Tax Rates – 2018, BC Budget 2018. 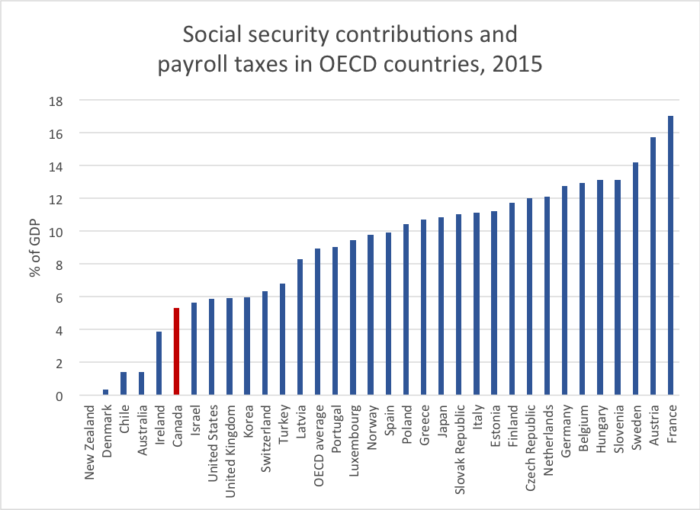 See OECD Revenue Statistics – Comparative Tables for up-to-date comparisons on items: “Social security contributions” and “Taxes on payroll and workforce.” See also Kesselman, J. (1997). General payroll taxes: economics, politics and design. Canadian Tax Foundation. See Table A1.2, Corporate Income Tax – Tax Expenditures, BC Budget 2018.